In a sharp contrast to what the 4-1 score may suggest, Tuesday saw a marked improvement by Bridlington Town who more than matched high-flying Tadcaster Albion for more than 70 minutes. One of the main problems with Town at the moment is that their goals are only coming from one source with Lewis Clarkson having scored five out of a total of nine while the Brewers have seven players who have netted on at least three occasions and the Seasiders’ are being punished for individual mistakes. Town made three changes from the side that lost to Nostell with Chris Jenkinson making his first start of the season and Clarkson and Ombeni Ruhanduka returning after injury and suspension respectively. 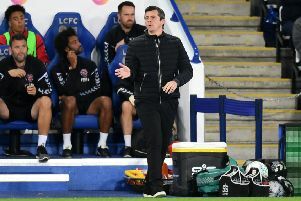 The visitors took the lead after eight minutes when James Whittingham collected the ball just inside the opposition half and played it into the penalty area where Clarkson set himself before firing past goalkeeper Gary Stevens. Town created more than their hosts but could not add to the score although both Ruhanduka and Clarkson went close. With two minutes of the first half remaining Ruhanduka lost possession deep in the Tadcaster half and the ball was swept forward to George Conway who hit a blistering shot over Hitchcock from 25 yards. Town continued to have the better of the play early in the second period and Tadcaster were thankful to clear the ball off their own line and Joel Sutton surprised Stevens with a 20-yard effort that the goalkeeper just managed to hold low down near his right-hand post. Former Town favourite Josh Greening came closest for the Brewers by hitting a post and bringing a good save out of James Hitchcock. The game started to go away from the Seasiders’ 17 minutes from the end when Ash Allanson was booked for scything down Greening and from the resultant free kick Andy Milne turned the ball in from eight yards. Town made a double substitution and shortly afterwards Ruhanduka wasted a good chance and then failed to find Joel Sutton who was in a good position. Tadcaster finished the game the stronger and Adam Baker sealed the game for them by twice tormenting substitute Andy Coverdale before driving home from outside the penalty area in the 83rd and 89th minutes.